ThirtyFity was established in 2002 by Chris and Jane Scott and is named after the latitudes where the majority of the world's wine grapes are grown, between 30 degrees and 50 degrees latitude, North and South of the equator. Our wine tastings proved popular with groups of friends with an interest in wine who liked the idea of being entertained (and educated) with wine. From private tastings at home we quickly expanded to corporate events and wine courses and we introduced an online shop, enabling customers to buy any of the wines they'd enjoyed at our tastings. From our early days in the London area, we've increased our national coverage with a team of wine experts running tastings across England, Wales and Scotland. In 2015 we were delighted to win the International Wine Challenge Wine Educator of the Year award for the second time! 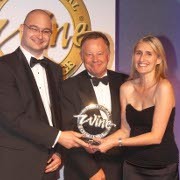 We first won the award in 2008 and to win again was a great achievement, recognising our team's great efforts in educating more and more people about wine through tastings and courses, as well as the educational benefits of our weekly wine podcast, The UK Wine Show. Now in its tenth year, the podcast is produced by Chris with news and interviews to give a deeper insight into latest trends and hot topics within the wine industry. If you get a chance, do tune in. We hope you'll find lots of ideas and info on learning about wine as you browse our website and that you'll be joining us soon for a ThirtyFifty wine tasting experience in 2019 and beyond! Chris, Thank you, everyone had a great time. Jane was fab, all the girls commented on her. She was very organised and happy to join in with the banter and fun. It was a great way to start the weekend.